The quilted leather seats are a nice touch. Roadsters haven't been selling well for Mercedes lately. But the German automaker is rolling out some special editions in the hope of drumming up a bit of extra sales before it rethinks what it's going to do for the future. The Grand Edition spruces up the Mercedes-Benz SL-Class roadster for 2020 with a series of upscale enhancements that may not bring it up quite to Maybach standards, but comes a fair bit closer. The list of upgrades starts on the outside with a special Graphite Grey paint job, offset by a combination of chrome and matte silver trim. It also rides on a set of AMG-style 10-spoke forged alloys, measuring 19 inches at the front and 20 inches at the rear, with polished rims and fitted to a lowered sport suspension. But inside is where the Grand Edition truly stands apart. Tundra Brown Pearl leather from the Designo catalog is diamond-quilted and piped in Golden Olive Pearl. The multifunction sport steering wheel is wrapped in the same, but with perforated black Nappa leather grips. And to our eyes, it looks like a pretty upscale environment befitting of a model line that starts, sans the Grand treatment, at about $90k. 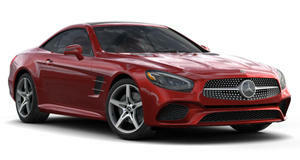 Buyers will be able to choose between SL450 and SL550 specs, with the AMG SL63 left out of this particular special. The lower version features a 3.0-liter twin-turbo V6 good for 362 horsepower and 369 lb-ft of torque for a quoted 4.9-second 0-60 time. The higher-spec model comes with a 4.7-liter twin-turbo V8, rated at 449 hp and 516 lb-ft of torque to deliver a 4.3-second sprint. Last year Mercedes sold just 2,126 SLs in the US, making it one of its slower sellers – just ahead of the more expensive AMG GT and the cheaper SLC, which was also announced in a special Final Edition for 2020.